WSJ: Area Allies Fear US Pullback in Middle East. Israel and Saudi Arabia fear that a combination of American war-weariness, energy independence, and economic troubles could herald a U.S. withdrawal from the Middle East, according to The Wall Street Journal’s Washington Bureau Chief, Gerald Seib. Sunday’s Geneva deal with Iran appears to be the latest evidence that Washington wants to close the books on the region’s hard-to-solve problems and, above all, to avoid military entanglements. President Barack Obama appears willing to use the military but only for pinpoint operations that do not entail a continuing commitment. The sentiment in Jerusalem and Riyadh is that Washington is pulling back while Tehran will be playing a bigger regional role, according to the Journal. The U.S. allies see a lessening of America’s footprint in the region from Iraq to Afghanistan and from Syria to the Iranian nuclear threat. The Obama administration’s recoil from the military-led regime in Cairo, which overthrew the Muslim Brotherhood government, has concerned both Saudi Arabia and Israel. The White House has long hinted that it wants to pivot American foreign policy from the Middle East toward Asia. It is a strategy that troubles Israel and Saudi Arabia which are dependent on American power for their ultimate survival. With Washington seemingly interested in pulling back, leaders in both Israel and Saudi Arabia are feeling increasingly insecure, according to the Journal. This uncertainty over American staying power could push Jerusalem to take unilateral action against Iran’s nuclear facilities and drive Riyadh to purchase a nuclear weapons capability from Pakistan. Saudis Punish 2 Men For Aiding Woman Christian Convert. RIYADH, Saudi Arabia — A court in Saudi Arabia has sentenced two men to lashes and prison terms for converting a woman to Christianity and helping her flee the conservative Islamic kingdom, the Saudi Gazette reported on Monday. A Lebanese man was sentenced to six years in prison and 300 lashes for converting the woman, while a Saudi man was sentenced to two years and 200 lashes for aiding her escape abroad, the English-language daily said. It added that the pair had challenged the verdict and would appeal. A spokesman at the justice ministry could not immediately be reached for comment. In Saudi Arabia, the birthplace of Islam, it is against the law for Muslims to abandon their faith, a practice known as apostasy. Proselytizing for other religions or practicing them openly is also illegal. Judges have considerable leeway in how to interpret the kingdom’s Shariah code of Islamic law and are not bound by sentencing guidelines or a system of precedent. Both capital and corporal punishment are legal. The case emerged last year after the woman’s family complained that she had been “brainwashed” by colleagues at the insurance company where she worked and that they had helped her leave Saudi Arabia via Bahrain on false documents. The woman, whose name has not been released, was granted asylum in Sweden last year, the newspaper reported. Last year King Abdullah, who has promoted limited reforms since coming to the throne in 2005, opened a center for religious dialogue in Vienna that drew criticism because of Saudi Arabia’s own lack of religious freedom. In 2008 he sponsored an inter-faith conference in Spain. Saudi Arabia’s Top Cleric: Twitter ‘A Council for Jokesters’. RIYADH, Saudi Arabia — Saudi Arabia’s top religious cleric has criticized the social media website Twitter, calling it “a council for jokesters” and a place for unjust, incorrect messages. Grand Mufti Sheik Abdul-Aziz Al-Sheik made his remarks late Friday during a speech to other Saudi clerics. Twitter has been used by youth activists to galvanize protests in the Arab Spring uprisings, as well as by regional governments seeking to communicate with the public. The mufti’s remarks come on the same day that the imam at Mecca‘s Grand Mosque said people have the right to express themselves, but must do so cautiously in order to protect the nation’s prestige and unity. Rights groups have criticized Saudi Arabia for its limited freedoms and its ultraconservative mores. US, Saudi present united front on Syria, Iran. RIYADH, Saudi Arabia (AP) — The United States and Saudi Arabia on Monday presented a united front to Iran and Syria. They warned Syrian President Bashar Assad that they will boost support to rebels fighting to oust him unless he steps down and put Iran’s leadership on notice that time is running out for a diplomatic resolution to concerns about its nuclear program. After a series of meetings in the Riyadh, U.S. Secretary of StateJohn Kerry and Saudi Foreign Minister Prince Saud al-Faisal told reporters at a joint news conference that Assad must understand that recent scud missile attacks on regime foes in the city of Aleppo would not be tolerated by the international community and that he had lost all claim to be Syria’s legitimate leader. In his discussions with Kerry, Saud said he had “stressed the importance of enabling the Syrian people to exercise its legitimate right to defend itself against the regime’s killing machine.” Saud also decried the fact that the Assad continued to get weapons from “third parties,” a veiled reference to Russia and Iran, which have backed the regime through the conflict. “Saudi Arabia will do everything within its capacity, and we do believe that what is happening in Syria is a slaughter, a slaughter of innocents” he said. “We can’t bring ourselves to remain quiet. Morally we have a duty.” The Obama administration has resisted appeals from the Syrian opposition to provide it with weapons and ammunitions over fears that they could fall into the hands of Islamist extremists who have gained support among Assad opponents. But Kerry sidestepped a question about whether the arms reportedly being supplied to the rebels by Saudi Arabia and others were a concern. Instead, he criticized Iran, Hezbollah and Russia by name for giving weaponry to the Assad regime. Kerry did announce last week that the U.S. would for the first time provide rebel fighters in the Free Syrian Army with non-lethal assistance — rations and medical assistance. European nations like Britain and France are expected to soon send the rebels defensive military equipment and Kerry has said the totality of the aid could be enough to change the situation on the ground. Kerry is in Saudi Arabia on the seventh leg of a marathon nine-nation dash through Europe and the Middle East on his first overseas trip as secretary of state. During his trip, members of the five permanent members of the U.N. Security Council and Germany met in Kazakhstan with Iranian officials in the latest bid to get Iran to prove that its nuclear program is peaceful and not a cover for atomic weapons development. In addition to Saud and the Saudi crown prince, Kerry met in Riyadh with the foreign ministers of Kuwait, Bahrain and Oman, all of whom are equally wary of Iranian intentions. In a last-minute addition to his schedule, Kerry also saw Palestinian leader Mahmoud Abbas, who is visiting the Saudi capital. Kerry’s working lunch with Abbas came two weeks before the secretary is to accompany President Barack Obama to Israel, the Palestinian territories and Jordan to explore ways of restarting the Israeli-Palestinian peace process. 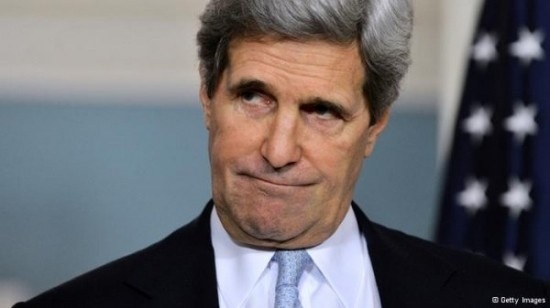 Kerry said he would talk with Abbas about “all the obvious issues” and that Israeli Prime Minister Benjamin Netanyahu was aware of the meeting, which was being held on the same day that Vice President Joe Biden is to address the annual policy conference of the pro-Israel American Israel Public Affairs Committee in Washington. From Saudi Arabia, Kerry heads into the homestretch of his lengthy first official trip abroad, traveling next to the United Arab Emirates and then Qatar before returning to Washington on Wednesday. 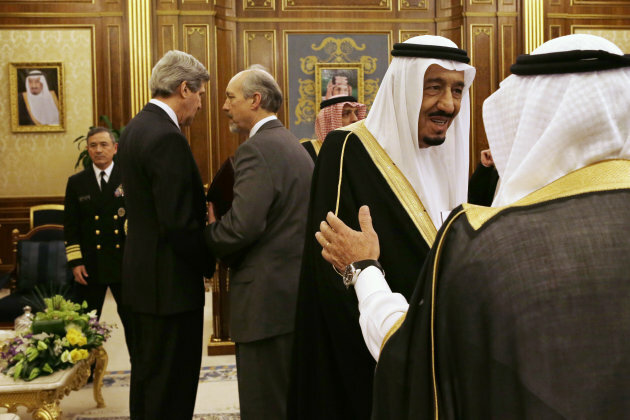 Kerry talks Syria, Iran in Saudi Arabia. But Kerry, who was meeting in Riyadh with the foreign ministers of Kuwait, Bahrain and Oman as well as the Saudi crown prince andforeign minister, added that “there is time to resolve this issue providing the Iranians are prepared to engage seriously” on proposals to defuse it. “The United States will continue to work with our friends to empower the Syrian opposition to hopefully be able to bring about a peaceful resolution, but if not, to increase pressure on Assad,” he said. The United States last week agreed to increase non-lethal aid to Syrian opposition groups. Saudi Arabia and several other Gulf states are believed to be involved in shipping weapons to Syrian rebels, who have yet to receive lethal aid from the West. They share deep U.S. concerns about Iran’s nuclear ambitions and increasing assertiveness in the region. Kerry also was to meet in Riyadh with Palestinian leader Mahmoud Abbas, who is visiting the Saudi capital. Kerry’s working lunch with Abbas was coming two weeks before the secretary is to accompany President Barack Obama to Israel, the Palestinian territories and Jordan to explore ways of restarting the Israeli-Palestinian peace process. Kerry travels next to the United Arab Emirates and Qatar before returning to Washington Wednesday. Obama Gives $250 Million To Muslim Brotherhood.